Watch out because there will be many people in life who will try to manipulate you or maybe they already have. There will be stiff penalties for these people because God is never mocked. 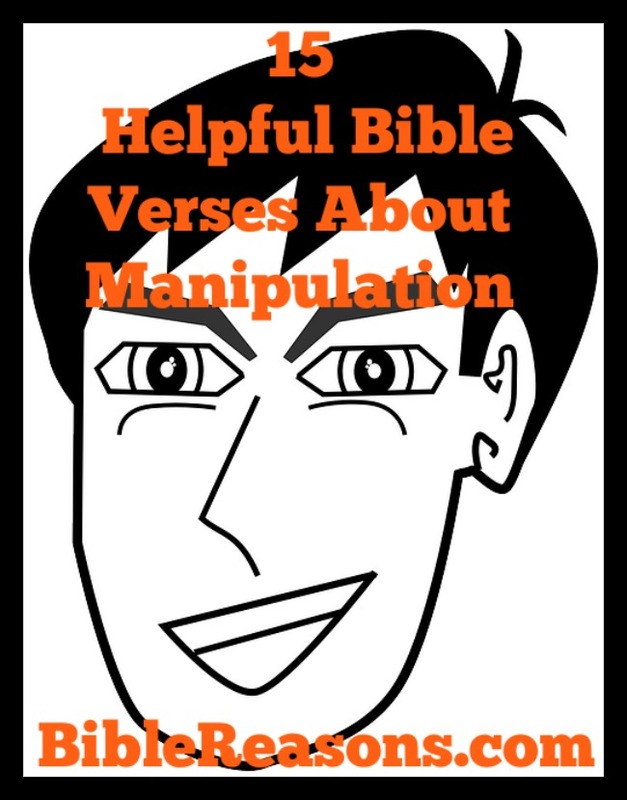 They try to manipulate by twisting, removing, or adding on to Scripture. Examples of this is some men use Scripture to abuse their wives, but they totally disregard the part where it says love your wives as yourselves and do not be harsh to them. They miss the part where Scripture says love does no harm to others. Greedy false teachers use manipulation to lie to others and to take their money. They use it to destroy Christianity and they are indeed sending many people to Hell. Many people are burning right this second because of false teachers. Many cults use manipulative tactics to deceive the naive. The way to avoid being manipulated by anyone is by learning the Word of God and using it to your advantage. Satan tried to deceive Jesus, but Jesus fought back with Scripture and that is what we must do. Rejoice that we have the Holy Spirit to help us and teach us as well. 1. Leviticus 25:17 Do not take advantage of each other, but fear your God. I am the LORD your God. 2. 1 Thessalonians 4:6 and that in this matter no one should wrong or take advantage of a brother or sister. The Lord will punish all those who commit such sins, as we told you and warned you before. 3. 2 Corinthians 11:14 And no wonder, for even Satan disguises himself as an angel of light. 4. Galatians 1:8-9 But though we, or an angel from heaven, preach any other gospel unto you than that which we have preached unto you, let him be accursed. As we said before, so say I now again, if any man preach any other gospel unto you than that ye have received, let him be accursed. 5. Matthew 7:15 “Beware of false prophets who come disguised as harmless sheep but are really vicious wolves. 6. Romans 16:18 Such people are not serving Christ our Lord; they are serving their own personal interests. By smooth talk and glowing words they deceive innocent people. 7. 2 Peter 2:1 But false prophets also arose among the people, just as there will be false teachers among you, who will secretly bring in destructive heresies, even denying the Master who bought them, bringing upon themselves swift destruction. 8. Luke 16:15 He said to them, “You are the ones who justify yourselves in the eyes of others, but God knows your hearts. What people value highly is detestable in God’s sight. 9. Ephesians 6:16-17 In addition to all of these, hold up the shield of faith to stop the fiery arrows of the devil. Put on salvation as your helmet, and take the sword of the Spirit, which is the word of God. 10. 2 Timothy 3:16 All Scripture is breathed out by God and profitable for teaching, for reproof, for correction, and for training in righteousness. 11. Hebrews 5:14 But solid food is for the mature, for those who have their powers of discernment trained by constant practice to distinguish good from evil. 12. John 16:13 When the Spirit of truth comes, he will guide you into all the truth, for he will not speak on his own authority, but whatever he hears he will speak, and he will declare to you the things that are to come. 13. Galatians 1:10 For am I now seeking the approval of man, or of God? Or am I trying to please man? If I were still trying to please man, I would not be a servant of Christ. 14. Revelation 22:18-19 I warn everyone who hears the words of the prophecy of this book: if anyone adds to them, God will add to him the plagues described in this book, and if anyone takes away from the words of the book of this prophecy, God will take away his share in the tree of life and in the holy city, which are described in this book. 15. Galatians 6:7 Do not be deceived: God is not mocked, for whatever one sows, that will he also reap. Matthew 10:16 “Behold, I am sending you out as sheep in the midst of wolves, so be wise as serpents and innocent as doves.